Healthcare is a high priority for the Mityana Charity. We are glad to support the diocesan (and other) clinics in rural areas, as they are often the only provision for the treatment of malaria and AIDs, ante- and post-natal care, and vaccination programmes. In addition we supply ongoing support for a mobile health worker in the area. 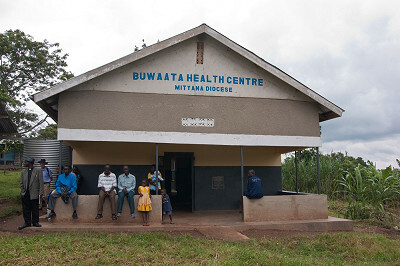 A new Maternity Building for Buwaata Clinic. Provision of facilities for water harvesting and storage, thanks to a generous grant from the Sykes Committee at St Sebastian's Church, Wokingham Without. This involved installing new gutters, pipework and storage tanks at Makonzi Clinic, Kyankowe Clinic, Kyato Clinic (and at Kyato School) and Mawujjo Clinic. One unusual part of this project was the replacement of an asbestos roof at Lulagala Clinic, with one of a more suitable material for collecting rainwater. In 2016 a couple in the USA sent a gift and the Medicor Foundation gave us a grant that together enabled us to provide a new Clinic at Kasoolo Secondary School. 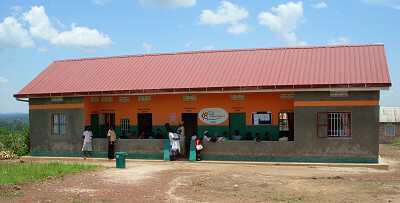 The clinic opened on 22 February 2017. We are very thankful for all who have contributed so generously to support this work, but we have already received a request to build another clinic in an area where there is no health provision at all, and when the money is available, we will be glad to build this clinic. There are many other things that could be done to help the local clinics. At many clinics the provision of accommodation for the live-in staff is very poor. For example we are aware of one place where the only accommodation available to the nurse on site is in a ward which is shared with TB patients.